I received a very nice email from Ken Trombly the main organizer of the Washington Symposium on Magic History that takes place April 25-27, 2013. He has just added two speakers to the list of an already superb line-up. David Saltman is going to be speaking about Jerry Andrus. David will also reveal some details about his new book 'The Escape Artist' which deals with Houdini's time in Russia. I'm very excited to hear about both of these topics. David also runs the blog Houdinifile.com which I have now put up a permanent link here on the site, and I'm sorry I didn't put it up before, I dropped the ball on that one. Not only does David cover some great historical items about Houdini and Magic History he also includes BATMAN! You can't get better than that! Next we have the author of the new book 'Metamorphosis', Bruce McNab. 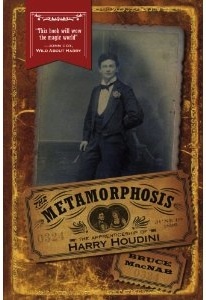 This is the book about the early years of Houdini while he was in Canada. According to several of my trusted Houdini friends this book is a must read. I have not yet gotten a copy of the book, but I know it's going to be fantastic. When they put a quote on the cover by John Cox, you know the book is going to be good. This will be my very first magic history conference and I can't tell you how excited I am. For one, I know I'll be meeting a bunch of the folks who read my blog and the many folks I've been corresponding with for quite some time. I may even have a booth there with my artwork. Here is the link for the conference! I hope to see you there. Dean, thanks for the kind words and the promo! Every time you mention me my web traffic goes up like 50%. The late, great Jerry Andrus and I were close friends for more than 20 years. I followed him with a camera on many magic & ghostbusting adventures, and will be giving him the kind of memorial that he deserves. 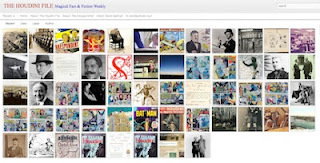 Just a bit about Batman & Houdini: - Batman appears on the blog only insofar as he has a deep and surprising connection to Houdini. I do not want to turn off true-blue Houdini lovers: I promise, there are many fascinating connections between the two - including their "origin stories." This is what led me to The Houdini File's pioneering research on Harry's father. I completely understand the Houdini/Batman connection. If I had the time I'd actually make a separate BATMAN only blog, but I've got my hands full right now with this and my many other projects. Jerry Andrus was an interesting fellow. I never met him, but was always fascinated by his creations. Look forward to meeting you at the Symposium! Yes, Jerry was unique. Just about every great magician in the world has made a pilgrimage to his eccentric old house in Oregon. He never got the public recognition he deserves. Marvin Minsky, the artificial intelligence guru at MIT, once told me, "Whenever we run out of ideas, we just go see Jerry Andrus!" 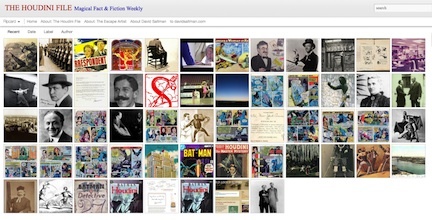 FYI, my pal Howard Latting has just started a good Batman blog called The Dark Knight Dossier.